"Charlie Wilson's War" is the untold story of a whiskey-swilling, skirt-chasing, scandal-prone congressman from Texas, and how he conspired with a rogue CIA operative to launch the biggest, meanest and far-and-away most successful covert operation in U.S. history.--Description of a book about Charlie Wilson. Coming soon, to a theater near you--the real Charlie Wilson. Coming later perhaps to a theater off campus, a movie about Charlie Wilson, starring Tom Hanks. Former Texas Congressman Charlie Wilson will be this spring's Faculty Distinguished Lecturer Series speaker. His presentation is scheduled for 11 a.m. April 14 in the Lowman Student Center Theatre, with a book signing to follow. Wilson's topic is "The Red Army's Last Battle and the Collapse of the Soviet Union." The book "Charlie Wilson's War," released in April 2003, was on the New York Times bestseller list. The entertainment publication "Variety" reported last summer that Tom Hanks' movie production company, Playtone, had bought the rights to the book and Hanks will play the lead role. Reviews of the book reveal why Wilson is expected to be one of the most colorful speakers in the history of the Distinguished Lecturer Series, which was established in 1980. Speakers have included Ashley Montague, Arthur M. Schlesinger, Jr., Zbigniew Brzezinski, John Kenneth Galbraith, Alvin Toffler, Richard Leakey, George Gallup, Jr., Larry McMurtry, David Halberstam, Lech Walesa, former president George Bush, and others. Born Charles N. Wilson, in Trinity, Texas, he attended Lon Morris Junior College, Sam Houston State Teachers College from June 1950 to September 1951, the University of Texas from September 1951 to February 1952, and then the United States Naval Academy, from which he graduated in 1956. While serving 12 years in the state legislature and 24 years representing Huntsville and Sam Houston State University nationally, the Lufkin resident held some of the most influential committee assignments in Congress. He is credited with bringing more than $20 million in appropriations to Sam Houston State University in the last 10 years of his Congressional career. He was presented the SHSU Distinguished Alumni Award in April 1989. In Congress Wilson was known for his escapades outside its hallowed halls as well as for his passion for U. S. national security, military preparedness and foreign policy. George Crile's book, "Charlie Wilson's War," chronicles the central role Wilson played in getting U. S. support to Afghan rebels during their war with the Soviet Union in the 1980s. It presents the case that it was this war that resulted in the fall of the Soviet Union and the end of the Cold War. Wilson is the only civilian to ever receive the CIA's "Honored Colleague Award," presented in 1993 by James Woolsey, CIA director. "Though that war is of historical interest in and of itself, the topic is most timely because of its implications for the terrorist attacks of 9/11," said Mitzi Mahoney, assistant professor of political science and chair of the distinguished lecturer committee. "Congressman Wilson offers a fascinating analysis of the conditions that led up to the rise of the Taliban and Al Qaeda in Afghanistan," said Mahoney. "He can also offer insight into the war on terror, the war in Iraq, and the future of Middle East politics." 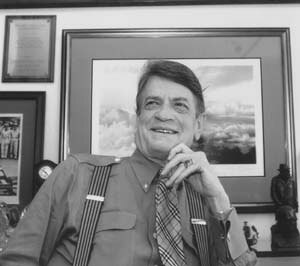 Charlie Wilson is currently the president of Wilson Associates, LLC, representing the interests of the government of Pakistan and defense and aviation firms.